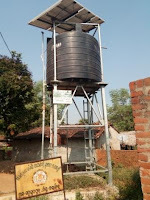 Blog of Sudhir Mishra, A Bolangir based Journalist: Solar power tube well -water supply lying defunct more than one year in Bolangir. Solar power tube well -water supply lying defunct more than one year in Bolangir. 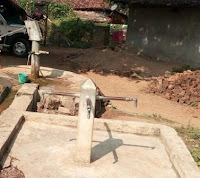 Solar power tube well -water supply lying defunct for more than one year in Bolangir. It is a common to find tubewell in village lying defunct due to the apathy of official and lack of maintenance, in rural areas. However when besides the manually operated tubewell is fitted with the extra machine and operated by solar panel , also lying defunct for years due to lack of maintenance and repair for years is a point to worry. Earlier we used to take water from the tubewell operating manually.Three years ago ,a machine was fitted inside the tubewell and solar panel was installed. After this installation, water would be filled up in the tank automatically and we would get water from the standpoint constructed thereby turning on the tap says Chakra Munda a villager ofMohmmadpur , located 18km away from here in Deogaon Block. Majority of villagers belong to Kolha tribe(ST). However one and half year ago the machine stopped working. we faced a lot of difficulties in getting water.we complained to the local authority and those who came to repair told us to remove the machinery installed there in Tubewell. With no option left, we removed the equipment and we are taking water from tubewell manually. When we contacted the toll free number, for repair, we could not understand what it told.We the urge authority to repair the defunct machine installed in the tubewell made the solar panel operated tubewell functional and reduce our daily ordeal says a villager. (another photograph of standpoint remaining dry as the solar-powered tubewell is not functioning.